Virtual reality means the creation of an artificial environment with the help of software and presented it in such a way that users accept it as real.It can be experienced with the help of two of our senses i.e. sight and hearing.We can receive any information with the help of our senses and accepts it as real. Same like that anything presented to us with the concept of reality is assumed to be real whether that is reality or not. That thing refers as virtual reality. Virtual reality is involved in presenting computer generated virtual environment to our senses which we can look at in fashion. Virtual reality describes a three dimensional computer created surroundings by some person. That person may be a part of that environment and capable of making any change in those surroundings.A number of systems are used for this purpose i.e. Google glasses and headsets etc. To create the fantasy of realism, these are used to inspire our senses. In virtual reality, eyes of the users are located in that artificial environment and graphics reacts with the body gestures of the user.Head mounted display is one of the famous devices of virtual reality. Obviously, virtual reality is used in the gaming industry on large scale. 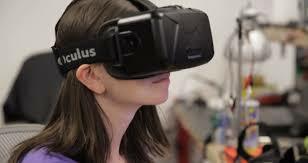 The support of oculus rift headsets had been made jerry-rigged in various games like auto grand theft and Skyrim. On the other hand following games e.g. elite dangerous used built in headset support. Many, proved good user interfaces metaphors, are adjusted for virtual reality. But the industry is more rapid to acquire for the games having true virtual reality hardware which are widely available now. Ideas from scientific and engineering fields got benefits from virtual reality. Latest modernism in displaying technology has created a lot of interest almost in every field, from structural design to molecular visualization to weather models. Even in the military, medical practice and aviation training, virtual reality training is an eye-catching substitute as compared to live training along with expensive and sensitive apparatus and in dangerous situations.Realistic cockpits, featured with VR technology, used by commercial pilots in holistic training programs that involved in live directions and virtual flight. Virtual tools can be used to train surgeons and let them transfer their virtual abilities in Operation Theater. Studies had already shown that it helped physicians faster with fewer mistakes. Virtual raids guide police and army to hit their targets without placing their lives at risk. Virtual reality is the formation of virtual surroundings presented to us in such a way that our senses assume it as real. A number of technologies are used to achieve this target and is a technically intricate feat that has to be appreciated for our cognition and perception. It can be used for multi-purposes i.e. serious and entertainment. It is the cheaper and common among the technologies. We are expecting more advancement in technology in near future and possible betterment in virtual technology through which we can work and communicate.